On data, we identified ways in which advances in that field enable us to sharpen our “radar” and increase insight. There is no magic solution but there are valuable gains to be made by going further in data analytics and related technologies with parts of the private sector. We have made important progress already. Used in combination with knowledge from our behavioural science experts, this will give us an earlier and richer picture of our cases. It could also help us spot more quickly when individuals known to us from the past re-engage with terrorism. We do not have the resources or legal justification to actively monitor those many thousands of individuals. The challenge we are addressing is how to detect signs of developing intent. Islamist terrorism predominates by scale but we are also concerned about the growing threat from other forms of violent extremism — the third theme. Violent extremism covers a spectrum of hate-driven ideologies, including the extreme right and left. The police have been working hard to combat these threats, and over the past few years have stopped a number of right-wing terror attacks from getting through. Sadly, as the murders of Jo Cox, MP, in 2016 and Makram Ali outside Finsbury Park Mosque in 2017 demonstrated, as well as those in New Zealand, we have seen an increase in such forms of violent behaviour. 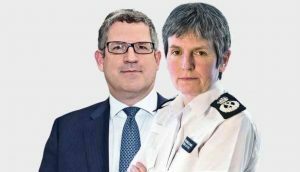 MI5 has now joined the police in tackling the most serious end of the problem.